This dish is so simple, but soooo good! 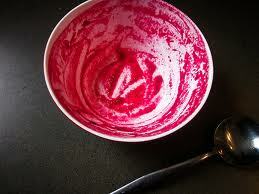 It strikes a brilliant balance between the sweet earthy taste of beetroot and the salty tang of crumbly feta. The tomatoes add acidity and richness. This soup looks amazing with its rich red colour and is suitable either as a starter or main and can be served warm or hot. Raw grated beetroot makes a stylish garnish for the cold version. Thanks to Hugh Fearnley-Whittingstall who presents this recipe in his book “The Original River Cottage Cookbook”. Peel the beetroot and grate them coarsely, or chop them into small dice. Heat the oil in a pan and sweat the onion in it for a few minutes, until soft. Add the beetroot and stock and bring to the boil. 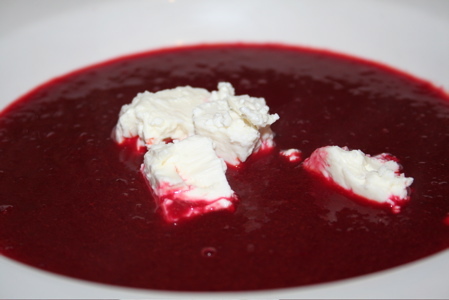 Season lightly with salt and pepper, then simmer gently for 7-10minutes, until the beetroot is tender. Stir in the tomato sauce, transfer the soup to a blender and process until completely smooth (or use a hand blender to whizz it up in the saucepan, which is what I do, just be careful you don’t splash the hot soup on yourself!). Taste and adjust the seasoning if necessary. Reheat the soup until thoroughly hot, but not boiling. Divide between warm bowls and crumble over the feta cheese, then serve with crusty bread and organic butter. This roast tomato sauce recipe is good not just for the Beetroot Soup (overleaf), but anytime you want to use a really rich and tasty tomato sauce, such as for a pasta sauce, stew or soup. It is really just a smooth puree of sieved roast tomato, but the flavour is absolutely excellent. It freezes well and so it is a great way to make use of a glut of tomatoes. Arrange the tomato halves, tightly packed but not on top of each other, in an ovenproof dish. Mix the garlic with the olive oil and drizzle it evenly over the tomatoes. Season lightly with salt and pepper. Roast in a medium-hot oven (180°C/Gas Mark 4) for 35-45 minutes, until the tomatoes are soft, pulpy and slightly charred. Rub through a sieve, discarding the skins and seeds. Use as is in the Beetroot soup, or even for an instant pasta sauce.